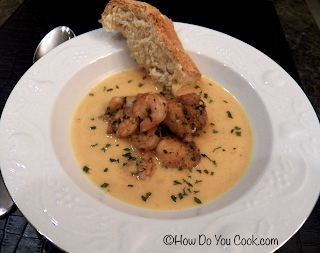 For day 20 of Soup Month 2013, we made a creamy Seafood Chowder with shrimp and swai fish fillets. My plan for this chowder was to combine a light, vegetable and herb broth with spicy shrimp placed in the center. Then I got to thinking how tasty the swai fillets would be with the same Sriracha-based marinade. I decided to add the fish to the mix, and it was a delicious success. To create the flavorful broth, the onion, celery and carrots are sautéed with a bit of white wine and a tablespoon of lobster base, which adds a deep layer of flavor to the soup. The soup is then pureed and the cooked seafood is placed in the center of the bowl to provide a burst of spicy flavor to the chowder. This chowder makes an excellent dinner on its own, but it would also be perfect served in smaller portions as a first course, or even as an appetizer. 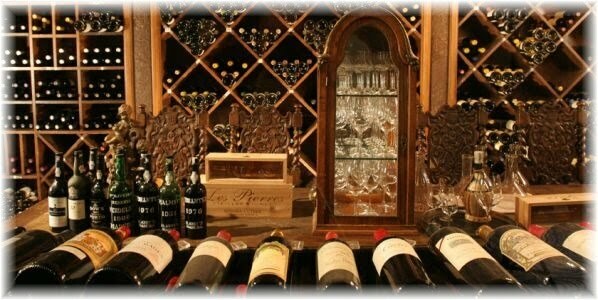 Serve with crunchy French bread and a glass of chardonnay. Enjoy!! In a medium glass bowl, combine the marinade ingredients with the fish and shrimp, stirring to coat the seafood. Set aside for 15 - 20 minutes. In a large soup pot, heat butter and olive oil over medium heat. Add the onion, carrots, celery and cook for 5 minutes. Add the garlic, thyme, bay leaves, lobster base, pepper and salt, and cook for 2 minutes. Increase heat to medium-high, add the wine and cook until reduced by half, about 5 minutes. Add the broth and bring the mixture to a boil. Reduce heat to a simmer, add the cream and cook for 15 minutes, until slightly thickened. Remove the pot from the heat and carefully use an immersion blender to puree the soup until completely smooth. Heat a large skillet over medium-high heat. Add the fish and shrimp mixture to the skillet, including the marinade, and stir gently, cooking until the seafood is fully cooked, about 7 - 8 minutes. Remove the skillet from the heat and keep warm, if needed, until ready to prepare the soup bowls. Ladle the soup into bowls, place several pieces of fish and shrimp into the center of each bowl, top with a sprinkle of fresh chopped parsley and serve.